Hello dear friends, followers and visitors, thank you for coming by here today. This is Astrid hosting our latest challenge. 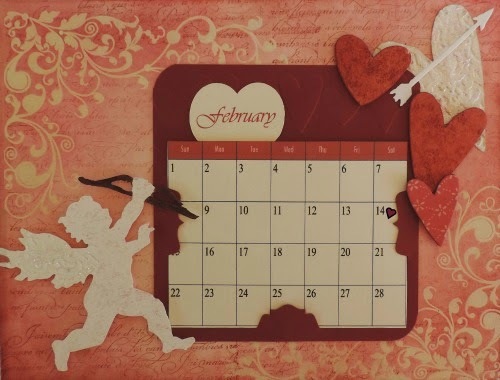 For this challenge please share what moves your heart with us, be it a Valentine's card for a loved one, a heart themed project, or something else that expresses what true love means to you. Just make sure that Tim's style is evident in what you make. Like always, our winner will receive a £10 shop voucher from our wonderful sponsor, Country View Crafts as well as a blog badge and the opportunity to join us here as a guest for a future month's challenge. We also award 'Pinworthy' badges to 3 runners up. My amazing team mates have poured lots of love into their wonderful creations, I'm sure you will agree that there is lots of inspiration! 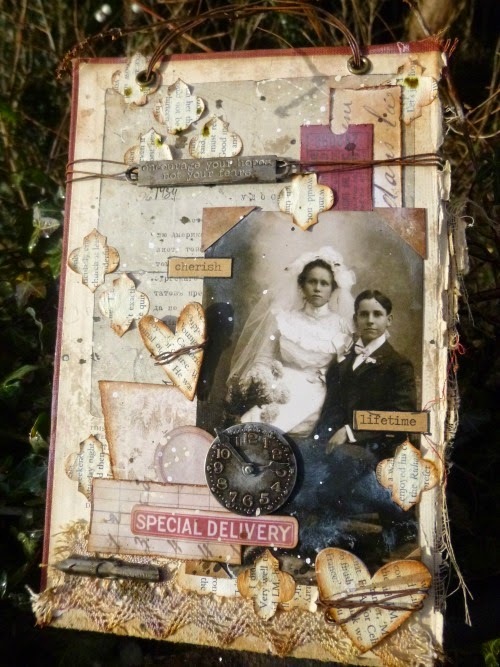 This whole piece is created on a vintage book board from a hardback which was disintegrating. The board had some Russian ephemera on the inside page, so that was the starting point for the collage around this young Russian bridal pair. The dark red accents in the collage echo the colour of the book cover cloth. Come over to Words and Pictures to hear the couple's story, and find out the name of the book too! 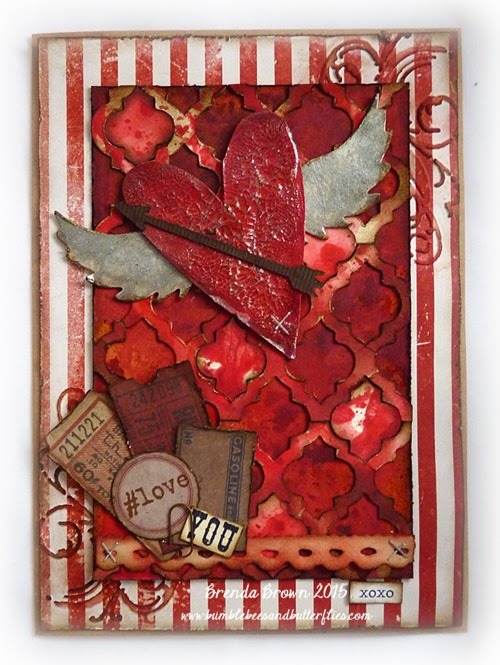 For this theme I have created a layered card using a variety of products both from Tim Holtz and other suppliers. 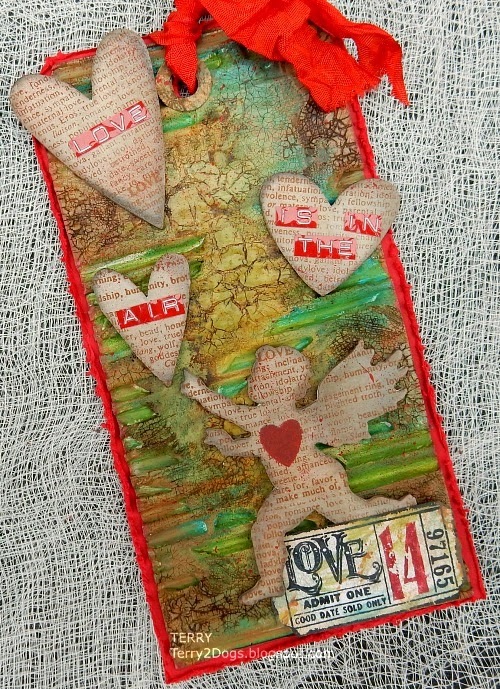 Lots of embossing and distress paints create the layers and the hearts. Do pop over to Addicted to Art for more details. For this great challenge I wanted to share a page from my flip calendar. It is easy to see Tim's influence here. I used his movers and shapers dies as well as his Love Struck Die. You can see more details by visiting my blog "My Crafty Life On The Internet". 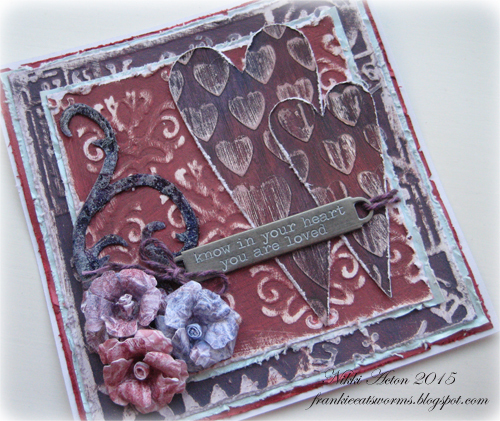 Astrid's timely challenge inspired me to use Tim's In the Bag die to create two sweet vintage Valentine treat bags. 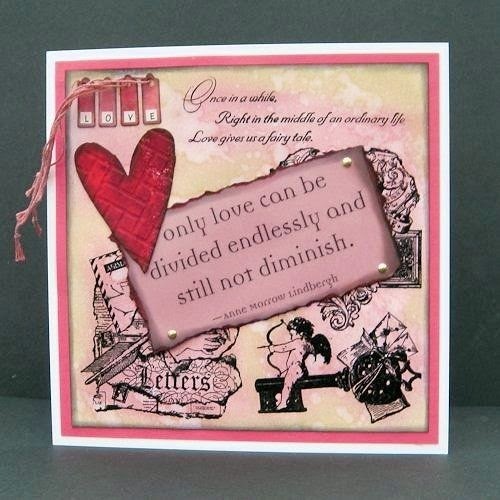 I used lots of Idea-ology items, crackle paint, stenciling and inks. I have lots of pictures and a description of how I made these sweet Vintage Valentine Treat Bags on my blog post here. I decided to use the opportunity to journal the fact that in April it will be 40 years since my husband and I first started going out together - where does the time go ? 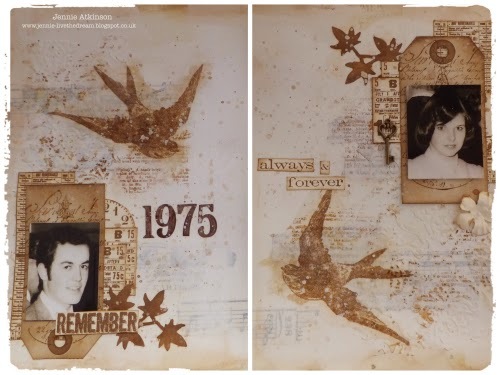 This mixed media page is very much in my own style but using Tim's products - tissue tape, stamps, texture paste, layering stencils, ink, spray and dies - which goes to show how versatile they are in mixed media pieces. There are more details on my blog if you wish to join me! I have long wanted to produce a project based on Tim’s Heart and Soul project so Astrid’s challenge theme was the ideal opportunity. Please click here to see how I made my Valentines Heart with Soul. I was so happy that Astrid chose "Love is in the Air" for our next challenge, as I needed that encouragement to create something a little sweet for my honey! Tim came to the rescue with his movers and shapers, stencil and stamps and all added to a mixed media background of paints, stains and crackle! Stop by for all the details HERE. I made a Memory album for this project which I gave to my Husband Chris, to hold photographs of our Wedding Anniversaries over the years. Please pop over HERE to my blog to see close up shots of my detail. I think I should call this red on red don't you? I bet you can guess I've made a Valentine card for my hubby using lots of Tim goodies. 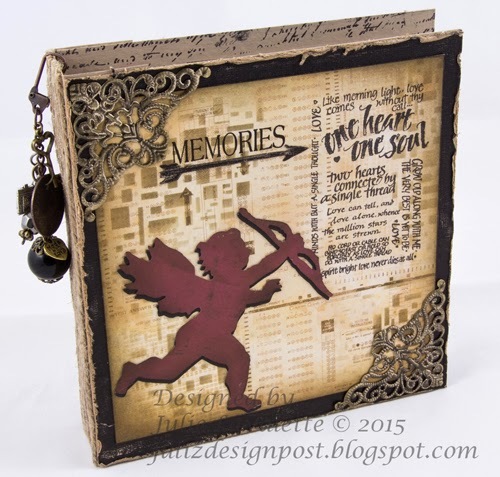 It has layers of papers, inks, paints, die-cuts and ephemera, all mounted on a kraft card. I wonder what he will make of it? Well I hope we have inspired you and given you some ideas, so hopefully you will play along and share with us what love means to you! 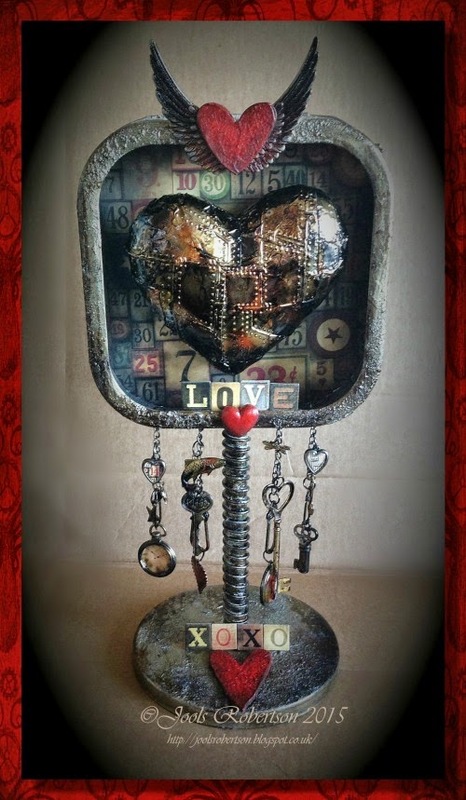 It's not necessary to use Tim Holtz products, but as we are a Tim inspired challenge, please make sure to tell us what Tim's influence in your creation is. Happy Valentines to you all and much love from your creative guides!! what wonderful and creative projects here ladies! So much love in so many styles! Great inspiration - can't wait to visit you all and see the details! Thanks for a great challenge Astrid. Our wonderfully talented teammates have done it again!! Great makes from you all ladies, have just done the rounds and each one of your projects is just amazing!!! So much love going on here and a whole lot of talent of the team! 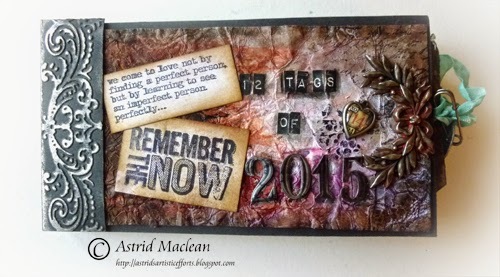 Great challenge theme, Astrid. A great challenge Astrid, must start taking a closer look at everyone's post. Looking forward to seeing the entries. Another fantastic collection... looking forward to hopping round once I've done my tax return!! Thank so much for the wonderful inspiration and for the fun challenge! What wonderful projects so full of heartfelt inspiration ladies! I hope to get a chance to play! Classic but obviously inspiring theme! Beautiful créations, ladies! Great challenge, Astrid, and wonderful inspiration from the Curiosity Crew! One of these days I am going to learn to have a long hard look at your work before I start mine, and save myself a lot of recycling! Welcome Barbarayaya and new winners. Destination Inspiration : Just the Ticket!